We offer preschool, recreational, and competitive gymnastics as well as tumbling for girls and boys of all ages. Bring your child to come flip, somersault, and swing in our 22,500-square-foot training center in Brighton, Michigan, while building their self-esteem and confidence. We offer a safe, clean, happy, and fun environment. Our coaches are some of the most experienced in the region and love what they do. We offer a solid base of exercise, agility, and discipline that will apply to any sport, group activity, and individual pursuit for a lifetime. If you want to throw a birthday party where the kids can run, jump, and twirl to their hearts' content in a safe environment, Infinity Gymnastics is the place to come! You don't have to worry about the mess or the weather--all of our games and fun are inside and supervised! We also host summer camps, field trips, holiday parties, competitive meets, exhibitions, and more. Saturday, April 20th 5:30-7:30 p.m.
Bring your cameras for a picture with the Easter Bunny! To read the article CLICK HERE! We will follow the Brighton Area Schools when closing for inclement weather for daytime classes only. For evening classes, check our telephone message after 2:00 p.m. for closing updates. Gymnastics and tumbling build coordination, confidence, and athleticism. Through competitve and recreational classes as well as camps, we create a fun and supportive environment to bring all of these important elements into our students' lives. Our skilled and highly trained staff ensure students are able to fulfill their potential and have fun while doing it! Preschool classes are held in our separated, age-appropriate Winnie the Pooh gym. Classes use equipment designed and sized especially for little ones. The classes are structured, but fun is part of our learning process and it's done in a safe, encouraging environment. We offer noncompetitive gymnastics classes for beginners all the way to advanced gymnasts aged 6-18. Students' skills and movements are periodically tested to determine their appropriate class level and when they should advance. They learn skills on the spring floor, uneven bars, balance beam, and vault. They also use the Tumbl Trak and trampoline. Tumbling classes are perfect for supplementing cheerleaders and dance classes and improving at competitions. 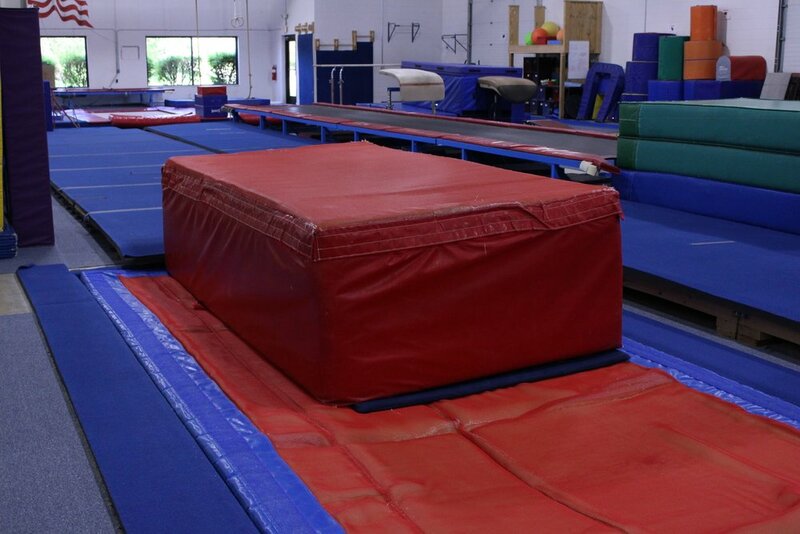 Trampoline class is designed for boys and girls who wish to learn tumbling skills on trampoline. It teaches body control and spacial awareness and is beneficial for skateboarders and snowboarders. Experienced students are welcome to try out for our competitive teams spanning all school ages for both boys and girls. We offer classes and private coaching for competitive gymnastics as well as host multiple competitive events. Every March, we coordinate the Clover Classic Invitational Meet at Eastern Michigan University for women's level 3-10, Xcel, fun meet, and men's level 4-10. See this year's dates for the Clover Classic! Open gym is a great time to practice movements outside of class and competitions. Instructors are present for supervision and safety. Unstructured tumbling class for cheerleaders. Come and work on your tumbling skills with Coach George. The fun never stops at Infinity Gym—it just keeps going and going! We're an exciting place to host birthday parties, field trips, and student groups (Girl or Boy Scouts, church groups, etc.) looking for a fun way to spend time trying new skills. Summer camp is a great time to try out gymnastics or work to perfect your back-flip! We offer single-day and week-long camps for gymnasts of all levels and experience, aged 3+ (must be potty trained). There's a lot happening at Infinity Gymnastics! The best way to stay up to date on our offerings and events is to view our calendar below. If you have any questions or would like to sign up for a class, please visit our Contact page. We'll be happy to respond to your questions via email if you will kindly fill out the contact form below.